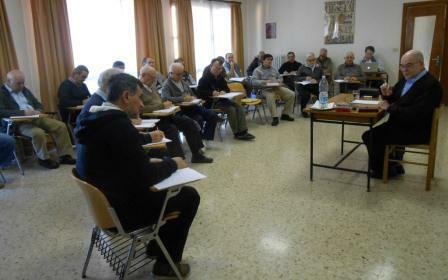 From January 7 to May 31, 23 Comboni Missionaries – 20 priests and 3 brothers – will be in Rome to take part in the 45th edition of the Comboni Renewal Course (CRC). The group is made up of confreres from 8 nationalities: 9 Italians, 4 Mexicans, 5 Spaniards, 2 Portuguese, 1 Eritrean, 1 Chilean and 1 Irish. The youngest is 45 and the oldest is 75. All of them come with a rich missionary experience on five continents, where they gave themselves to a variety of services, from parish pastoral work to specific pastoral mansions, from mission promotion to formation. The CRC is coordinated by Fr. Siro Stocchetti, Bro. Guillermo Casas and Fr. Danilo Cimitan. The Comboni Renewal Course (CRC) is an opportunity offered to the missionaries to pause, to distance themselves from their work and to focus their attention on themselves, in view of a global renewal: Physical, psychological, spiritual, communitarian and apostolic. Through personal and community prayer, study and reflection, the personal contact with the life and the spirituality of Saint Daniel Comboni, the reflection on the Rule of Life, Spiritual direction, fraternal life, the sharing of experiences and the pilgrimage to Comboni places and to the Holy Land, the CRC intends to give to each participant the help that is needed in order to review one’s life, to be renewed in the light of the Word of God and of the Comboni charism and then resume the missionary journey with new strength and renewed motivations. The CRC is coordinated by Fr. Siro Stocchetti, Bro. Guillermo Casas and Fr. Danilo Cimitan. These three missionaries – together with Fr. Manuel João Pereira Correia – share the responsibility for Ongoing Formation (OF) at the level of the Institute. Fr. Siro has been working in OF for 11 years. He left Brazil, his missionary province, on Christmas 2001, to join the community of the Comboni Year of Ongoing Formation (CYOF) in South Africa. Since then, the missionary has followed eleven editions of this initiative of OF, six of them in Mexico, four in South Africa and the last one (2011-2012) in Rome. On the first day of the CRC, during the presentation, all the participants underlined the importance of this moment and expressed a feeling of gratitude towards the Institute which places at the disposal of the confreres this precious “desert” time. Among the participants there was from the beginning a climate of mutual acceptance and familiarity, a great ingredient for the success of the Course. 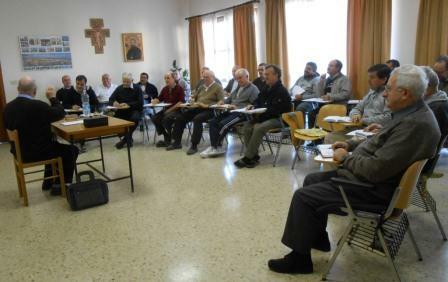 P. David K. Glenday speaks to the participants of the 45th edition of the Comboni Renewal Course in Rome.